The #1 scale-out NAS storage platform just got even better in a BIG way. New today, Isilon platforms include all-flash, hybrid, and archive storage systems that allow enterprise customers to take on a wide range of new, more demanding unstructured data applications; achieve faster business outcomes; store, manage and protect massively large data sets with ease; and gain new levels of efficiency. The timing couldn’t be better. As the digital economy extends its reach, IT strategy is quickly becoming a critical competitive advantage (or disadvantage) for businesses. The need to support the unconstrained scale and massive performance requirements of powerful applications of today and tomorrow is putting IT organizations everywhere under pressure. From the need to support 4k/8k streaming in the media industry, to the pressure to deliver life-saving treatments through genomic sequencing in the life sciences industry, examples of this phenomenon are everywhere. Industry Leading Performance and Capacity: The Infinity architecture enables Isilon All-Flash nodes to deliver up to 9x the IOPS, 18x the throughput, and 20x the capacity of the closest competitor. Investment Protection: Thanks to the magic of the OneFS operating system, all new nodes can integrate seamlessly into existing Isilon clusters. Check out the impact the new Isilon solutions have made at Translational Genomics Research Institute (TGEN). All-Flash: Announced at Dell EMC World in October 2016 and generally available in the coming weeks, the Dell EMC Isilon F800 provides extreme performance and efficiency for the most demanding unstructured data applications and workloads. 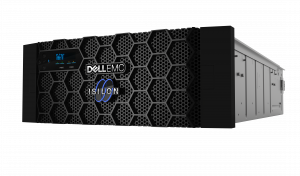 Hybrid Platforms: Three new Dell EMC Isilon versatile hybrid storage platforms – the Isilon H600, Isilon H500 and the Isilon H400 – provide a balance of performance, capacity and value, delivering up to 120k IOPS, 3 GB/s-12GB/s bandwidth and up to 480 TB capacity per chassis. Archive Platforms: Two archive systems – the Isilon A200 and the Isilon A2000 – address the growing need for efficient and secure long-term data retention, providing options for both active and deep archive storage. All of these new platforms are powered by Isilon OneFS, which means that customers can take advantage of the data protection, simplicity, storage efficiency and scalability that they have come to expect from Dell EMC Isilon. The new platforms are designed to integrate seamlessly into existing Isilon clusters. We continue to introduce innovations to IsilonSD Edge, our software defined storage solution for edge/ROBO locations. IsilonSD Edge now provides increased flexibility for customers through new deployment options, including support for SAN storage and virtualization solutions. The IsilonSD Edge software will be supported on the latest Dell PowerEdge 14th generation servers. Please visit the Isilon homepage to learn more about these announcements!